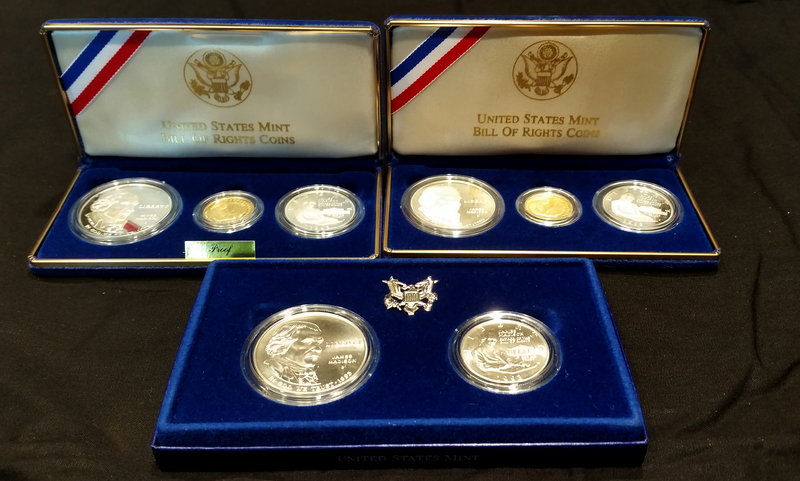 Three boxed sets of 1993 US Mint Commemorative Bill of Rights Gold and Silver Coins. Box 1 - 3 Coin Proof set includes certificate of authenticity. Set includes Gold Five Dollar Coin, Silver Dollar Coin and Silver Half Dollar Coin. Box 2 - 3 Coin Proof set includes certificate of authenticity. Set includes Gold Five Dollar Coin, Silver Dollar Coin and Silver Half Dollar Coin. 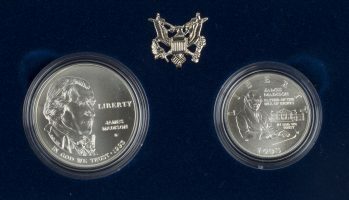 Box 3 - Two Coin Uncirculated Set includes certificate of authenticity. Set includes a Silver Dollar Coin and Silver Half Dollar Coin.